As I’ve stated previously I’m not crazy about lip gloss but hot damn do I love this one! 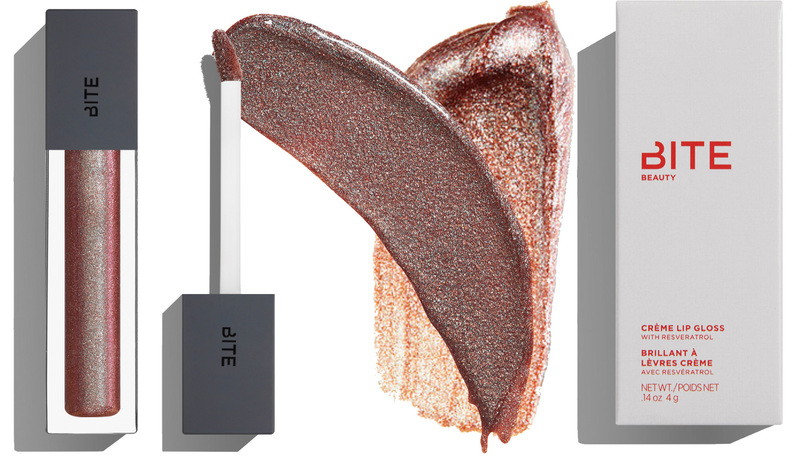 This gloss is considered a lip creme which I’m not exactly sure what it means, but to me, it’s a soft gloss. When applied it doesn’t have that gooey sticky feeling, it’s just tacky. It has a light graininess when worn but only in the slightest. It wears well and has really good opacity when applied coat by coat. – When lightly dotted on the lips and rubbed in the lips are given a really pretty sheen. – Apply 1 coat and the colour is interesting and noticeable but not overpowering, it’s a colour that others would compliment but not stare at. – Two coats and WOAH baby it’s noticeable and bold and there’s no distracting from the colour. Major cosmetics production facilities said they weren’t able to produce formulas without some synthetic ingredients – a deal-breaker for Bite Beauty; so instead they built a lipstick factory in Toronto, where the products are handmade. They own Bite Beauty Labs where customers can mix and create tie own lipsticks, you can choose everything from the finish down to the smell within 30 mins. Have you made your own lip products? I’m really interested and would love to hear what your experience was like.